Another exciting development this past month was our Office Dog, Lemony Cricket, winning the Muse Ultimate Office Mate competition! She faced fierce competition from other adorable dogs from the offices of Global Giving, AOL, Uber, & Zoosk. In the end, Lemony emerged victorious as the Ultimate Office Mate! Thank you to everyone who supported our beloved pup. 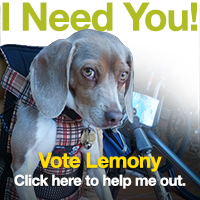 We’ve included some adorable GIFs of Lemony as thanks! We’ve added a ton of cool features to Expensify so far this year and we’re just getting started. We have a HUGE announcement coming up this month, so stay tuned. Expensify is only getting better! Thanks for your support and have a great weekend!